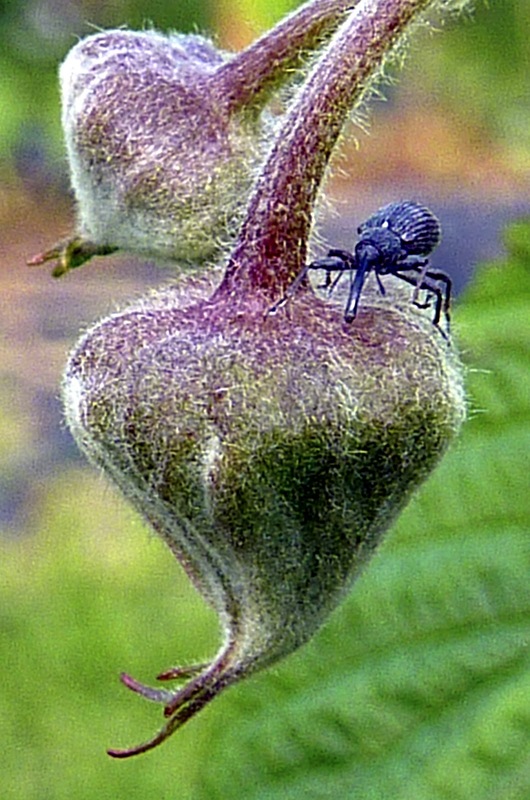 Byturus tomentosus, the Raspberry Beetle and and Anthronomus rubi the Strawberry Blossom Weevil are two important insect pests of soft fruit such as strawberry and raspberry. Agroscope, near Martigny in the Rhone Valley in Switzerland have been trialling different trap and lure combinations over a couple of seasons and I was pleased to visit this week to see how trials were progressing. Open field raspberries are getting more difficult to find in the UK so standing high up on the valley wall looking out over to Verbier on a warm June afternoon made the journey well worthwhile. In strawberries, the blossom weevil attacks the flower buds at all heights and the optimum height to deploy the traps is not yet understood. Placing the traps at the edges of field next to hedges where weevils are likely to have overwintered will give the most sensitive, early warning of the start of crop invasion. For tunnel grown crops, traps should be set at the ends, near the entrance, where weevils are likely to enter from hedgerows or adjacent infected crops. Adult Raspberry Beetles can cause damage early in the season by feeding on blossoms, buds or new leaves of host plants. This rarely causes serious problems unless beetles occur in large numbers, when significant crop losses and poorly developed, malformed fruits may result. 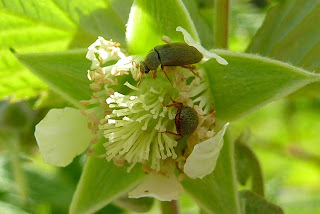 Raspberry Beetle Monitoring Traps should be placed in the field before the first beetles appear, typically 4 to 6 weeks before first flower appears and the traps maintained until at least the end of the flowering period. This is normally between April and July but flowering can be longer in protected cropping systems or with autumn fruiting varieties. Where the crop has an extended flowering and fruiting season, it is beneficial to continue to trap beetles during the fruiting period. The exact time of insect emergence will vary with location and season. We will follow the trials with interest and aim to improve our recommendations as the data comes in. Himalayan Balsam - If you see it - pull it out!